As heat rises and we begin to shed our layers, a coat of armor dismantles to reveal our physical selves. Now before you go out and dismember your friend, remember you don’t have to exchange limbs with an Instamodel. I’m sure many of you are bikini body ready as it is, what with having bodies and all. Forgo the celery fast for a nice BBQ rib (again, don’t dismember a friend) and a side order of Caesar salad. However, here is not a human being on this ball of earth and water that does not at least once get worried about their body. You may have the urge to perch yourself high upon that weeping willow and claim that it is not true, but even in this bird-like state, you must give into the feels. One fabulous full moon, I was walking past our Baroque floor mirror after a relaxing blood bath. Only, instead of the usually “Damn!” my brain emitted more of a “eughhff”. Rather than bury it in my subconscious, I – admittedly, after a little hustle – got off my headless high horse and admitted: “Well, I don’t feel at my most ghastly today.” Luckily, the feeling has now passed and I’ve decided to share a couple tricks and treats on body empowerment with you Fab Bats. For just a moment. Not feeling like a dreadfully dashing deity? Happens to all of us. Take a moment to mourn a time when you were great and powerful. Once you sense enough time has passed – remember, some of us take longer or are faster than others – seize that power once again as the rightful ruler of this kingdom. It may take years, days or seconds. Do you think I became confident under the span of a quick-cooking-one-minute oat? Naw. It took a decade for my character to be developed (and finally get bigger hair, phew)! Sometimes, you also need that little extra push to get back in business. Speaking of push, take a look at StyleLikeU. These short videos by a mother/daughter team feature individuals from all walks of life. Interviewed on self-acceptance, emotional evolution and exterior expression, each tells a heartfelt story. No sap, no crap, it’s really vegan raw. Kelvin, creator of Notoriously Dapper – a + size male fashion blog – is a huge advocate for body positivity. It cracks the lack of representation in plus size men with a wiff of dandy. Featured above is the equally dapper William Beave Brooks. 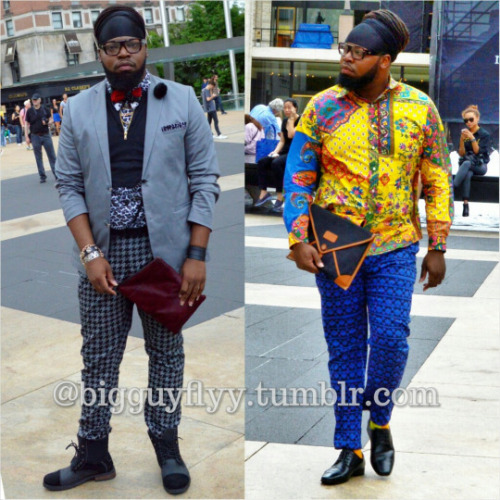 Fashion blogger, he seeks to slay in size and inspire others to do so as well. The Body Empowerment Series, by Caroline who suffered from an eating disorder for 10 years, aims to uplift through testimonies, writing, videos and other works. Essie Golden – Fab Bat model and loud voice in the bodi-posi community – will be hosting her Golden Confidence Pool Party in LA for those States side. The Internal Acceptance Movement is a “space for self-acceptance, empowerment, mental wellness and healing”. A fav, browsing through the photos, advice and quotes really is a mood lifter. We’re all in a constant process of finding our Selves. The key is to creep on. How do you feel about acceptance? Have you come to terms with your body? Or would you prefer to be reborn into the celestial void?